In recent days, fall has really been in the air. And for good reason - the first official day of fall is tomorrow! With this season comes so many delicious treats, beautiful views, and festive activities. This week's table is based around the quintessential fall feeling - shades of warm browns that will start taking over our external environment as the green fades, leaves fall, and the sun sneaks away earlier each day. 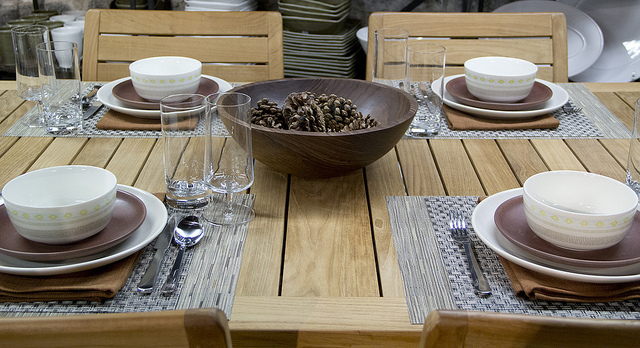 We created the whole setting around this simple bowl of pine cones. Pine cones, along with pumpkins and apples and colorful leaves are indicative of the season. Shown here in a Spencer Peterman bowl (sold in-store), they made for a wonderful focal point on the table. The place settings started with a really interesting layered look, which gave them more dimension than a traditional setting might have. On the bottom was a Chilewich Rectangle Bamboo Tablemat in Dune, followed by a Chilewich Kono Square Placemat in Asphalt, and then a Libeco Home Napoli Vintage Napkin in Brick. Having the contrast between vinyl placemats and linen napkins was really interesting and different. The dinnerware trio included a iittala Sarjaton Bowl in Tikki, a Heath Ceramics Coupe Salad Plate in Redwood and a Heath Ceramics Coupe Dinner Plate in Linen. We chose a simple, classic flatware design, the David Mellor Chelsea Flatware. 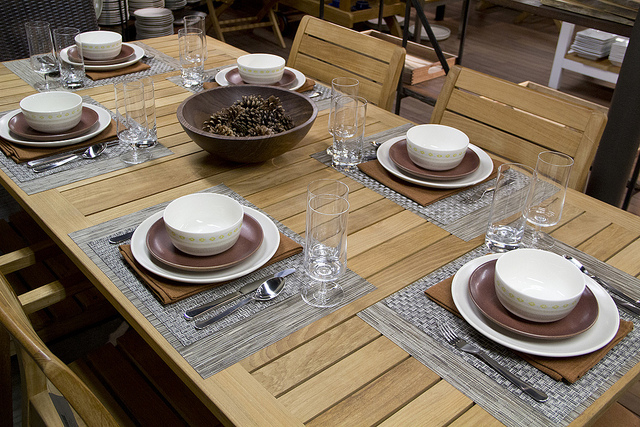 It has an understated look and feel that is nicely suited for a wide range of different table settings. The glassware duo came from Schott Zwiesel collections. We highlighted the Schott Zwiesel Basic Beer Small Pilsner (Stem) and the Schott Zwiesel Iceberg Iced Beverage Glass. How are you diving into fall festivities this year?